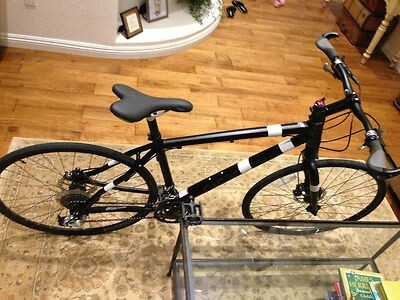 2009 Cannondale Bad Boy Ultra Hybrid Bicycle Large Frame Has about 1000 miles on it. Has original tires and break pads. Never had flats. It is in excellent condition. This is the Ultra model with Juicy hydraulic disk breaks and lockable head shock (suspension). This is a hybrid bike with mountain frame. For mountain biking, you only need to swap the tires. This is the Large frame. They come in Small, Medium, Large and X-Large. I am 5'10" and the medium frame was tad small and the Large tad big. The Large frame was still comfortable for me. I have added Ergon Grips (see photo) You can search google for 2009 Bad Bay Ultra Spec, to get the complete spec The bike will we professionally packaged by local bike shop.